My younger son, C, is almost four years old. A cheeky and loveable rogue, he is rapidly redefining the meaning of the term “Mommy’s Boy”, such is his attachment to his number-one fan a.k.a. my wife. However, there is one thing that C loves more than his mother. It’s not a fancy toy or a tasty treat. It has nothing to do with any animals or digital gadgets. It is … a shirt! 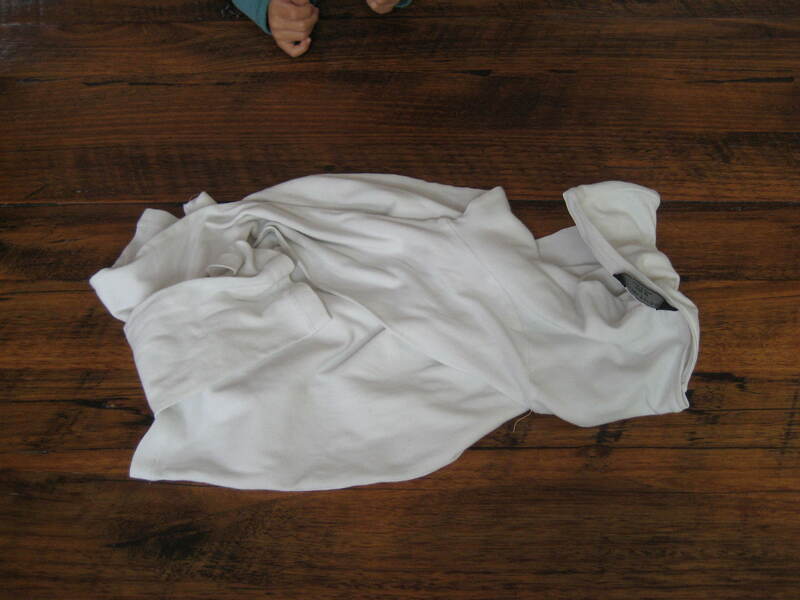 Just a plain, boring white (and often filthy from his drool and spills) cotton shirt – a shirt that not only has no logos or cute robot prints, but has more wear and tears than it has threads. What’s more, he doesn’t even wear the shirt, as it is my wife’s old shirt from the days of B.C. (Before Children). It was given to C soon after he turned one, as a sort of comfort blanket to help him settle during sleeps. Notice C’s little hands approaching “bor bor”! This comfort blanket, pictured here and christened “Bor Bor” by C himself, is now his most important possession in the world. The attachment anxiety is so great that, even after a brief separation, C will cuddle, caress, kiss and literally inhale the god-foresaken thing. Ditto everytime he gets scolded for naughtiness, loses an argument with his brother, doesn’t like his dinner or just doesn’t like the way the wind is blowing. For some reason, I was thinking about this ridiculous attachment while running the other day. As I was laughing it off, it suddenly struck me that C’s affection for such an unremarkable item is no different to how I can’t seem to live without my favourite pair of joggers-one that’s now six years old, probably pounded almost 3,000km in distance and is always the pair that I lace up when participating in official races. It is in such an unsightly condition that, if I donated to a homeless person, he will probably throw it right back at my face! In other words, my emotional attachment to my joggers is no less intense than C’s to his “Bor Bor”. I should keep that in mind the next time I catch C cuddling, caressing, kissing and inhaling it. While I may not do the same to my favourite pair of joggers, the feeling is the same. This entry was posted in Parenting, Uncategorized and tagged anxiety, Attachment, jogging shoes on October 13, 2012 by The Jogging Dad.